A successful Science Fiction romance is a difficult thing to achieve. Part of it has to do with SF fans not wanting the romance part to interfere with scientific extrapolation. (In my experience, Romance readers are far more catholic in their tastes). The potential for camp (I’m thinking of Jacqueline Sussan’s Yargo), and the marketing of such a book add yet more layers. Karen Lord’s second novel is completely different from her debut, the excellent retold/remixed Senegalese folktale Redemption in Indigo. It’s a love story hidden in and around a LeGuin-style anthropological quest/planetary travelogue novel. 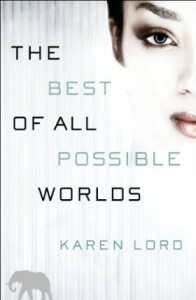 Mostly narrated in the first person by the vivacious and chatty government biotechnician Grace Delarua (with lots of clever asides and some exclamation points), The Best of All Possible Worlds follows the fate of the stoic, telepathic Sadiri, who have been relocated to Cygnus Beta after a viscous and unprecedented massacre on their home planet. Cygnus Beta is a sort of galactic dumping ground for orphans of the three strains of humanity (the Sadiri, the Ntshune, and the Zhinuvians). As such, there are trace elements of all cultures seeded and hidden in the large planet. Since the Sadiri population has been mostly decimated, they feel that they have to build up their population. Grace is assigned to assist the Sadiri in their quest to find suitable cultures and mates on Cygnus Beta. Grace’s main contact is Dllenahkh, who is the de facto leader of the mission, which mostly consists of visiting various settlements and cultures on the planet, and doing genetic testing. In this sense, Lord’s novel is almost a ‘mundane,’ or slice-of-life SF novel. There are no superheros or monsters, and the book has a leisurely, episodic pace—kind of like life. Because of that, Lord mostly focuses on the bizarre and intriguing chemistry between the impulsive Grace and the inscrutable Dllenahkh. Dllenahkh is neither a brooding hero or a Spock-like ascetic. He is a believable alien with odd flashes of recognizable human behavior that seem to surprise even himself. Plotwise, there are a lot of incidences and strange, ‘sense-of-wonder’ set pieces, which I won’t spoil. They aren’t just there for window-dressing for the Grace-Dllenahkh love story; various ethical issues are addressed, from the issue of ‘cultural purity’ to religion, to the issues around telepathy and privacy. (Because of this, the plot does tend to meander). Additionally, Lord does through a bone or two to techno-fetishists—with shades of Iain M. Banks Culture novels. But The Best of All Possible Worlds is ultimately a relationship novel. No, it’s not a Nicholas Sparks novel set in a far future; imagine Jane Austen at her most psychologically astute as written by Ursula LeGuin at her most cerebral. « FROM WHERE WE SIT Wins a Moonbeam Award!